If it is the first time you are looking for an HVAC company or thinking about making a switch, the prospect can be daunting. Many people don’t realize exactly what their HVAC Company expectations should be and/or technician expectations. We’ve compiled these expectations to help you in your decision-making process. From the moment you call the company until the moment the repairs are done, your encounter with an HVAC company should be 100% professional. If you call a company and the representative seems rushed or begins trying to sell you products even before a tech has been dispatched to check into your issue, chances are that isn’t a company you want to work with. You should also ensure that the company you hire has the required education and experience necessary to be licensed by the state and insurance to protect themselves and you, should something go wrong. Many HVAC companies offer warranties and free estimates on their products and repair. Often, warranties cannot be honored if the system has not been serviced regularly. The HVAC company that does your work should be able to validate your service and upkeep. Make sure to ask if the company will honor or update your warranty information as part of your selection process. Another part of the selection process should be asking if a free estimate is available for service. Once a technician does come out for the free estimate, you should receive a full survey of your HVAC system and the tech should offer you systems and products that work best with your home’s needs and will save you money in the long run. A maintenance contract is always important to the health of your system and the safety of your family. Many companies offer bi-annual contracts for maintenance. If an HVAC company offers warranties on its products, it should also offer maintenance programs in order to ensure that the warranty conditions are met. Sometimes, when searching for an HVAC company, you’ll find that many in the same area charge approximately the same fees. They may not be exact, but if you find a company that is offering a much lower price on the same services as everyone else in the area, it’s possible there is more to the picture than what is contained in the initial bid. Many times a lower service fee can be a method used to get in the door so that additional costs you weren’t expecting to pay can be added to your bill. This can lead to a cost of the same amount or more than you would have paid to a more established company. 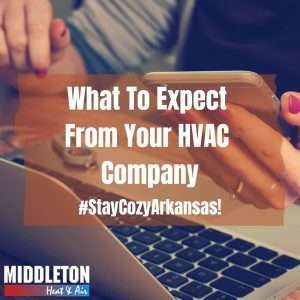 If you are looking for a reputable HVAC company with the professionalism, reliability, and experience necessary to take care of your needs, call Middleton! We have been a part of the central Arkansas business community for more than 40 years and voted Arkansas’s Best of the Best for the past 22 years. You can contact us online or by phone at 1-800-404-0371.